Today’s featured product is this darling songbird from KiniArt Studios. 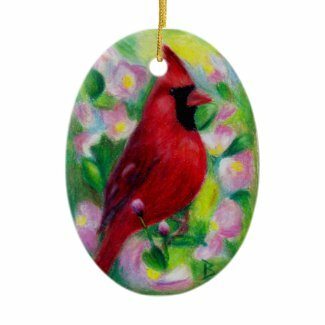 Designed by children’s author and illustrator, Kim Niles, this bright, cheery design is sure to bring a smile to young and old. Be sure to check the full line of available products. Today’s featured product is this pretty preening blue and gold macaws design. 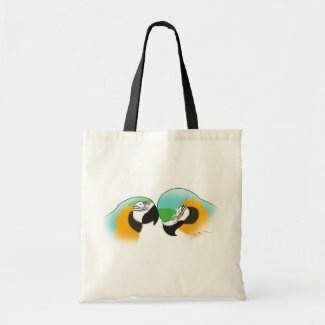 Created by Menagerie Mayhem, who had this to say about it: This beautiful parrot art has two blue and gold macaws involved in the most intimate of parrot behaviors – social grooming. The two colorful parrots preen each other tenderly in this original artwork by Susan Stoneman. Please be sure to check the entire line of products this beautiful design is available on. 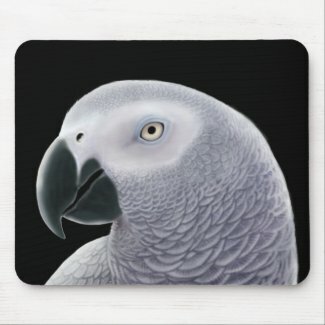 Today’s featured product is this beautiful African Grey mouse pad from Two Purring Cats. An original painting by illustrator Carolyn McFann, who does amazing work. Be sure to check all the items that this gorgeous African Grey Parrot is available on.